Textile applications range from apparel, household goods, furniture and carpeting to technical textiles used in medical, automotive interior and outdoor applications such as tensioned fabric structures, outdoor recreational products such as tents and backpacks, awnings, hoist sling webbing, etc. These span a variety of material chemistries from natural products such as cotton, wool and bamboo fiber, through commodity polymers such as polyester, polyolefins and polyamides, to high performance materials such as the polyaramid fibers used in protective gear and heavy lift applications. Dyed or other colored textiles can fade or color shift when exposed to the combination of heat, light (both UV and visible) and moisture. In addition, the natural or synthetic polymers can lose mechanical strength. Therefore, it is important to appropriately test textiles to determine their stability and durability to the environments in which they will be exposed. Atlas pioneered the laboratory lightfastness testing of dyed textiles with the introduction of the carbon arc based Solar Determinator in 1915, renamed the Color Fade-Ometer® in 1919. Since that time, Atlas instruments have improved on the light sources and weathering capabilities introduced in 1927, however Atlas Ci Series Fade-Ometer & Weather-Ometer, Xenotest and SUNTEST lightfastness/weathering instruments are the most widely recognized and used brands in the global textile industry. Lightfastness and weathering tests are typically performed to industry wide international test standards, such as those by the International Standards Organization (ISO), the American Association of Textile Chemists and Colorists (AATCC) and ASTM International (ASTM). Automotive textile standards are typically established by the Society of Automotive Engineers (SAE), the German Association of the Automotive Industry (VDA), the Japanese Automotive Standards Organization (JASO) or automotive OEM manufacturers. Additionally, other proprietary textile standards are established by trade organizations, governments and companies. “Lightfastness” refers to the resistance to color fade or mechanical property loss upon exposure to direct sunlight or window or automotive glass filtered daylight. “Weathering” refers to the full direct exposure to the outdoor or laboratory simulated elements of various climates, including liquid water. Atlas xenon arc based lightfastness/instruments. Rotating specimen rack instruments are preferred for textile testing with their superior uniformity of the specimen exposure to heat, light and moisture. Xenotest models are standards in the textile industry due to the typically small test specimen size and short exposure durations of many tests. Ci Series instruments suit the demands of higher test volume and duration applications and customers. Both series meet major international textile test standards. The SUNTEST XXL+ meets many textile standards not requiring rotating racks. 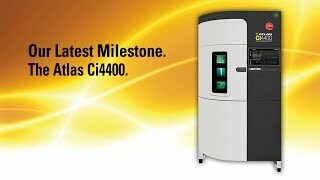 Benchtop SUNTEST CPS+ and XLS+ models feature xenon arc sources but have more limited temperature control and no humidity control. The SUNTEST XXL+ model features full parameter control and meets many textile standards in a flatbed exposure area design. Fluorescent-Condensation exposures using fluorescent sunlamps are performed in the UVTest instrument. Outdoor static direct or under-glass exposures. South Florida is a benchmark textile test location due to the aggressive, moisture and sunlight. Our Arizona site is also a prime test site due to the higher summer temperatures and solar radiation, and our Worldwide Exposure Network provides over 20 other sites for testing. Outdoor accelerated tests using the solar tracking and concentrating EMMA/EMMAQUA suite of exposure products are effective for testing durable technical textiles such as tensioned fabrics for roofs. Atlas Custom Systems solar simulation lighting system, frequently used in environmental chambers, can provide exposures of larger products such as backpacks, tents, etc. Automotive cabin textile flammability is tested with the model HMV Horizontal Motor Vehicles flammability test cabinet, and standards based on FMVSS 302. General textile lightfastness and weathering standards are typically by ASTM, ISO and AATCC. Application-specific methods, such as for automotive interior, often use these same methods or are modified in OEM or other standards and specifications. The following is a partial listing only, and other general lightfastness and weathering tests specified elsewhere may also be used. Please contact Atlas for the requirements of specific standards or specifications, or for recommendations on applicable test methods. American Association of Textile Chemists and Colorists. Society of Automotive Engineers International. Society of Dyers and Colourists.